The groundhog has spoken and we’re in for an early spring this year! 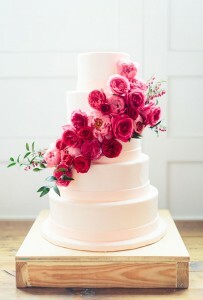 So it only seems appropriate to start dreaming about springtime wedding cakes covered in lovely, bright colored blooms. I love fresh flowers on wedding cakes – it is the perfect way to make a statement with your cake without being too over-the-top. And fresh blooms on a cake is a great way to add a personal touch – you can choose the same flowers from your wedding bouquet or something the compliments the theme of your wedding. The options are endless. This five-tier white and pink features a cascade of roses, peonies, and bleeding hearts and it is perfect for spring. It would also be lovely around Valentine’s Day! And if pink flowers aren’t your thing you can always choose another bright colored flower. You will find this cake here. It was created by The Cake Plate.